In April 1943, four boys searching for bird's nests while trespassing on Lord Cobham's estate near Hagley, England, found rather more than they expected. Within the hollow bole of an old Wych Elm were skeletal remains. The police were called and a massive investigation ensued. But, to date, no one knows who the female victim was... or how she died. We humans do not like unsolved mysteries and over the decades, many theories have been put forward. A recent spate of activity on the internet has reactivated interest in the case. Some of the theories, however, while quite fanciful, are not firmly rooted in the facts of the case. 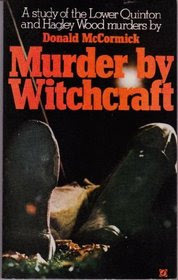 I have come across innumerable references to Donald McCormick's book, Murder by Witchcraft. Published in 1968, the book put forward an espionage connection. Alas, only fragments of McCormick's theories exist on the internet and so I decided to seize the bull by the horns and buy a copy of the book. It wasn't quite what I expected. The book is a slim paperback, a mere 189 pages in length, with 8 glossy pages of photographs. The reference list, which is of great interest to a serious researcher, is disappointingly short. There are 18 book references, most of which have to do with witchcraft. There are also 7 newspaper references. Still, I had bought the book, and so I read the entire volume in one sitting. The main focus of the book is the death of 74 year old Charles Walton, a farm labourer, near Lower Quinton on February 14, 1945. Stabbed through the neck with a hay rake and with a cross carved into his chest/neck by his pruning hook, the case reeked of witchcraft (at least to McCormick). McCormick then draws in the story of Bella in the Wych Elm as evidence of another unsolved mystery with possible links to witchcraft. It would appear that McCormick relied upon the newspaper articles for most of his information on the Bella case. He references the "Anna from Claverley" letters that were sent to a journalist and which suggested Bella's death was linked to a Dutchman, Van Ralt, who was gathering information for the Germans. From this tiny seed of concrete information (Anna's letters), McCormick then proceeds to make some rather wild assertions and assumptions. McCormick then makes some rather confused references to Abwehr diaries (none of which are referenced) while admitting that many documents are missing or inaccessible. McCormick then makes some tenuous connections between Lehrer's mistress, the 'Clara' parachutist and 'Bella' in the Wych Elm. After a "lengthy search of Abwehr III's records" [Abwehr III was concerned with counter-espionage within Germany], McCormick apparently tracked down Herr Franz Rathgeb, a former Nazi who had been in the German steel business and made frequent trips to the Midlands before the war. Apparently, Rathgeb was a recruiter of Nazi sympathizers in Britain. McCormick tracked him down in Paraguay, living under an alias [quite the feat I would imagine, but McCormick does not elaborate on how he managed this coup]. McCormick admits that the "foregoing is, of course, no proof as to the identity of 'Bella' " yet then turns around ad says "it certainly points to a strong possibility". I rather suspect that McCormick's standards of proof are much lower than mine, particularly as he cites no references in his book. He goes on to weave a very tenuous web around the mysterious Dutchwoman named "Clara', Lehrer's mistress and Bella. He then returns to his equally vague theories about the Charles Walton murder. A few dozen pages later, he revisits the 'Clara' topic while digging up information on Aktion Hess (horoscopes = astrologers = witchcraft). Perhaps 'Clara' had been rounded by during Aktion Hess? Or perhaps she had dabbled in witchcraft? McCormick notes that Frau Cremer was also very knowledgeable about occult matters. Obviously her credentials are impeccable. He is then off on a hunt for German spies in the Midlands. You don't have to search very far on the internet to find repeated denunciations of Donald McCormick. He apparently liked to write on controversial topics where hard facts were scarce, and where his reliance on oral informants made his conclusions unverifiable. I would classify him as a fictional historian. McCormick, to put it gently, stretched the truth a bit, or perhaps more than a bit. Writing after World War II, when many of the espionage files were still highly classified, McCormick could let his imagination run wild. Today, with many of the files declassified, his theories evaporate like mist in the sunlight. For those interested, there are a few sites that tear McCormick to shreds for some his "history" books. One site examines his book The Identity of Jack the Ripper (surprise, McCormick "identified" the "real" Jack the Ripper - and as early as 1959! Somebody should tell the world, or at least Wikipedia.). Simon Read's book, The Case that Foiled Fabian, (2014) notes that McCormick was "something of a controversial figure, as his use of anonymous sources made verifying his work difficult". No kidding. Another site looks at McCormick's reliance on Margaret Murray for the witchcraft theory and also has a post about McCormick himself. That post references Hayek: A Collaborative Biography - Part III, Fraud, Fascism and Free Market Religion, a series of essays written by a variety of scholars with experience of Donald McCormick. I am still tracking down a copy of the book but I gather that it eviscerates McCormick as a serious historian. Some even go so far as to call him a "fantasy historian". Enough said. Alas, McCormick's tenuous, and unverified, ideas have wormed their way out into the internet and metamorphosed into strange hybrids. For example, The Unredacted states: "According to McCormick’s information, A Nazi agent by the name of Lehrer was operating in the Midlands in 1941 and he had a Dutch girlfriend living in Birmingham called Clarabella Dronkers." That statement stretches McCormick's already tenuous theory to the breaking point. Even McCormick wasn't willing to admit with 100% certainty that Lehrer's girlfriend was a Dutchwoman named 'Clara' who was identified as 'Dronkers'. No idea where the Clarabella came from... at no point does McCormick call this mysterious Dutch woman "Clarabella". Any books published prior to the revelation of the British Double Cross system (J.C. Masterman's book - The Double Cross System - published 1972) are full of errors and inaccuracies. Many relied on recollections from former members of the German Abwehr (Lahousen and Ritter) who, unfortunately, were not aware that their spies had been compromised by MI5. Even books published between 1972 and the declassification of the MI5 documents in the early 2000s struggle with a lack of concrete information. McCormick's theories about Lehrer's girlfriend, the Dutch "spy" named 'Clara' and Bella in the Wych Elm are built upon inaccuracies. He provides no references or sources that can be used to substantiate his theories. Unfortunately, many readers and armchair historians have taken his tidbits of false information and treated them as if they were facts. They should be taken with, not just a pinch, but a pound of salt.